Apple’s latest MacBook Pro will hit store shelves in a matter of weeks, but will refreshed hardware and an OLED Touch Bar be enough to compete in an increasingly tough marketplace? Let’s compare the specs of the new MacBook Pro against those of another powerful 13-inch notebook, the HP Spectre x360. When you’re buying a 13-inch laptop, you’re going to sacrifice a little horsepower for portability, and it shows on the new MacBook Pro and the HP Spectre x360. Neither one is spectacularly powerful, but they can both be outfitted with increased storage space and RAM, though those options can get costly pretty quick. Comparing the base specs for both laptops, they’re on even footing. The new MacBook Pro features a dual-core Intel Core i5 processor alongside 8GB of RAM, which is nearly identical to the base model HP Spectre x360. Though it’s worth pointing out that the Spectre’s CPU is a 7th-generation Kaby Lake model, while the MacBook’s is a 6th-generation Skylake model. Though similar in raw clock speed, you might get a little extra mileage out of the Spectre’s processor, plus it can be upgraded to an Intel Core i7 for a little extra cash. The Mac does have an advantage in maximum storage size though, not to mention that the onboard Intel Iris graphics chip will outperform the Intel HD graphics chip found in the x360. All-in-all though, they’re pretty evenly matched, with a slight edge going to the MacBook Pro 13 with Touch Bar. This one’s another area where the HP Spectre X360 and 13-inch MacBook Pro come to the table evenly matched, but they both have a couple tricks up their sleeves. The Spectre’s display is crisp, sharp, detailed, but not quite as high-resolution as the MacBook Pro. However, the Spectre x360 comes with a touchscreen, and the MacBook Pro does not. Remember, the Spectre x360 is a convertible 2-in-1 laptop, so it pulls double duty as a tablet. For that reason, it’s might look like the Spectre has a leg up on the MacBook Pro in this round, but there are a couple other factors to consider. However, the MacBook Pro features a brand new Touch Bar where the function keys used to be, so you’ll be able to get a taste of a touchscreen experience. For the display category, the MacBook Pro comes out on top on account of its superior resolution. But if you’re a fan of tablets and you need your laptop to have a touchscreen, you might overlook those missing pixels on the HP Spectre x360. Apple made a lot of noise about the latest MacBook Pro being the thinnest, lightest, Pro offering in their lineup, but the HP Spectre x360 is also remarkably thin, particularly for a 2-in-1. The Spectre made waves earlier this year as one of the thinnest 2-in-1 laptops available, weighing in at just over half an inch thick altogether. Similarly, the 13-inch MacBook Pro also comes in at just over half an inch thick. So, we’re going to have to take a closer look. The HP Spectre x360 has a minuscule advantage here, with a height of 0.54 inches, which is just a hair thinner than the MacBook Pro which is exactly 0.59 inches thick. The Spectre also weighs less, at 2.58 pounds to the MacBook’s 3.02 pounds. All right, that’s splitting hairs, so which one is going to be more comfortable to carry around? The HP Spectre x360 is actually lighter by a fair margin, certainly enough to feel when you heft both laptops. You’re not likely to notice much of a difference once you toss it in your bag, but it’s worth noting that the Spectre is significantly lighter and a little thinner. In fact, the HP Spectre x360 might come out further ahead since it’s capable of performing as a tablet, and offers a slightly more versatile user experience – and may have better battery life, at a quoted maximum of 15 hours against the Mac’s 10 hours. Manufacturer estimates can be unreliable, so you should take that with a grain of salt. But, the HP does actually have a bigger battery, at 57.8 watts against the MacBook Pro 13 with Touch Bar, which has a 49.2 watt-hour unit. So there’s reason to think the HP may in fact be the winner. This round goes to the HP Spectre x360 hands-down, it’s thinner, lighter, has a bigger battery, and can pull double-duty as a tablet making it the all around winner when it comes to portability. If you look at wireless connections like Wi-Fi, and Bluetooth, the MacBook Pro and HP Spectre x360 have identical specs. Both support 802.11ac, and Bluetooth 4.0, the differences really come into sharp contrast when you have a look at those other ports. The USB ports. Given Apple’s war on ports, it should come as little surprise that the 13-inch MacBook Pro has done away with the MagSafe port in favor of a streamlined design which features four identical USB-C ports, and a single headphone jack. The MacBook Pro does not support USB-A, the traditional USB plug you’ve probably got lying around your home or office, so you might have to invest in some adapters if you’ve been eyeing the MacBook Pro. That said, the HP Spectre x360 also features a streamlined design and foregoes connectivity in favor of simplicity. The Spectre features two USB-C ports, one USB-A port, and one headphone jack. 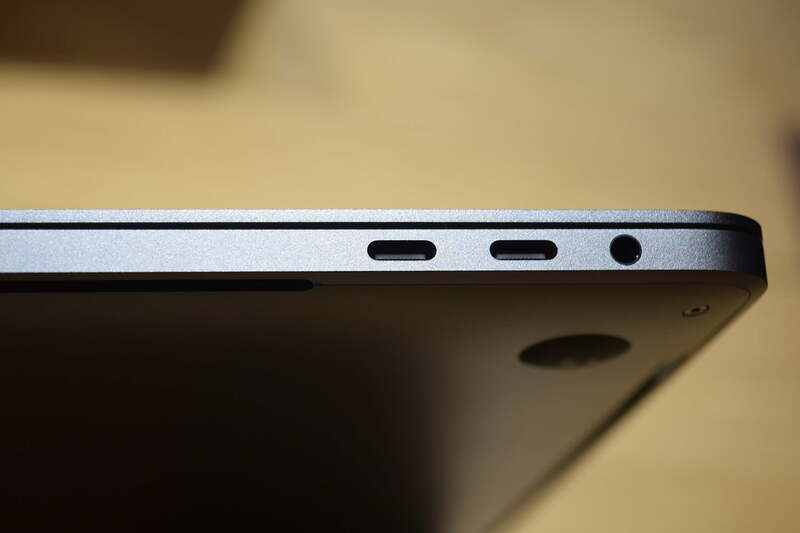 So, if you’re keeping score, the HP Spectre has four ports to the MacBook Pro’s five. This round is a draw. The MacBook technically has one more port than the Spectre, but the Spectre has at least one traditional USB port, and while USB-C is definitely the future of the I/O standard, most of us still have USB-A peripherals lying around so that port is going to see some serious use. If there’s one thing that sets the HP Spectre x360 and the MacBook Pro apart, it’s design. One epitomizes a classic, tried and true design, while the other forges down a new path, offering a uniquely flexible user experience. The MacBook Pro is, like all other Apple computers, built to exacting specifications. The internals are fitted perfectly within the chassis, without a single wasted millimeter, and it shows. The new MacBook Pro is just as solid, beautiful and understated as it always has been. It’s an elevation of the typical laptop design, rather than a radical reinterpretation and just by looking at it you’ll be able to tell if it’s the choice for you. The HP Spectre x360 on the other hand applies similarly high-quality build standard to a new form factor. The HP attempts tp deliver on the same kind of experience you’d have with a MacBook Pro, with the added functionality you’d get out of a tablet, and it succeeds for the most part. We’re going to just barely give this round to the MacBook Pro. The Spectre is an admirable attempt to capture that premium feel, but it’s just a hair behind, we feel. This mostly has to do with looks. Both laptops are very solid, but we think the appearance of the Pro is just a bit more alluring, while the Spectre x360 comes off as overly formal and business-like. This one is about as objective as it gets. Which one is more affordable? Which one will cost me an arm and maybe a leg? We’ll let the numbers speak for themselves. The 13-inch MacBook Pro, with Touch Bar, starts at $1,800. The HP Spectre x360, with nearly identical internal specs, starts at $1,050. The Spectre wins this round handily. You could almost purchase two Spectres for the price of one MacBook Pro, or buy a Spectre now, and buy a new Spectre in a couple years. This comparison certainly shows why some users aren’t that excited about the new MacBook Pro. In this comparison, the Pro does come out slightly ahead in performance, display quality, and design. But it also without question loses in portability, and it’s less versatile, since it doesn’t have a touchscreen. Then there’s the price. At $1,800, the least expensive MacBook Pro 13 with Touch Bar is several hundred more than the most expensive HP Spectre x360. Even the MacBook Pro 13 without Touch Bar is $1,500. That’s difficult to accept. Based on the numbers alone — with the caveat that we’ve only had hands-on time with these systems and our full reviews are pending — the HP seems the better buy.